The Port of Venice is situated in the Venice lagoon and can be accessed year-round, 24/7. Constituted of two port areas, Marghera and Marittima, the port offers 30 km of quayside where ships can berth. The Port of Venice is also the only port in Italy with an inland waterway port enabling cargoes to sail up the Po Valley. The Port of Venice includes two main port areas each of which has its own separate access: the Malamocco port mouth serves cargo ships (commercial/industrial traffic), while the Lido port mouth serves passengers ships (cruise ships, ferries, fast ships and yachts). The port can be accessed year-round at any time, including at night, and in all weather conditions. As a result, the Port of Venice can be accessed 24/7/365. Dedicated to cargo ships, the Malamocco port mouth is 14 m deep. Merchant ships reach the commercial/industrial port facilities through the Malamocco-Marghera Channel which is 11 m. deep and leads directly to the cargo terminals. The S. Nicolò port mouth is located between Punta Sabbioni and the Lido, and serves passenger traffic alone. Cruise ships, ferries, high speed crafts and yachts reach the Marittima facilities through the Giudecca Channel. With a constant draught of 9 m, this itinerary crosses the city's historical centre and provides a magnificent view over St. Mark's square. The Port of Venice is the only port in Italy to have an inland waterway port. Navigation along the only navigable river in Italy connecting the sea and the inland enable cargo, including containers, to be transported by barge to Cremona and Mantua. The Port of Venice's quayside is 30 km long and is distributed between the two port facilities of Marghera (15 km) and Marittima (5 km, including the berthing points in the centre of Venice). Furthermore, another 10 km of coastline have been consolidated in Marghera in view of their future use as quays. 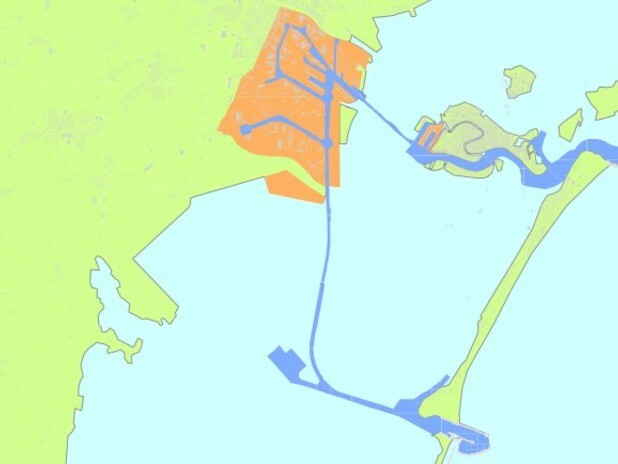 The draught of the Malamocco-Marghera channel, including the area facing the quayside, will be dredged to 12 m.
The Marittima facility (dedicated to passenger services) was renewed recently and the berths for mega yachts in the historical centre have recently been improved with new services. The Western Channel in Marghera hosts a marina dedicated to recreational sailing.